Cleaning out some unneeded stock. I've got a set of black front retractors and shoulder straps for a '73 with bench or std buckets. Color on shoulder straps is about as nice as you'll find used. They were super dusty and tucked up in the headliner retaining trims as though they had seldom (or, maybe never) been used. Retractors and straps are very nice, too. Asking $90 + shipping. I actually have some inner belts from a power bench seat that have the correct receiving buckles. 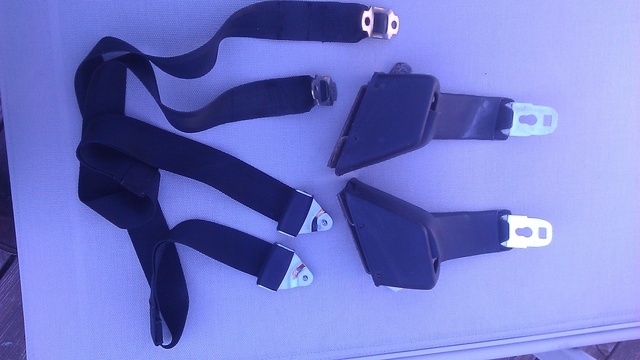 Also, have a set of inners for bucket seats with same correct receiving buckles. All of them have splits at the tops of the plastic sheaths. If interested contact me. 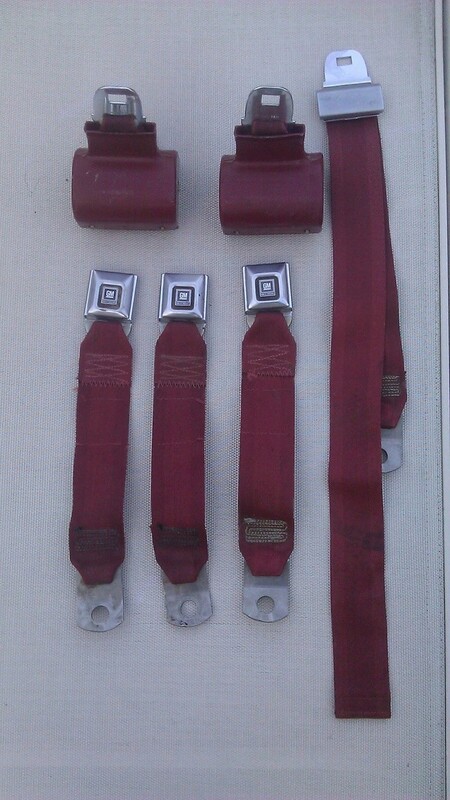 Next up are a set of Dark Oxblood Red rear seat belts. Tags are date coded 1975. I haven't cleaned these...but, they look pretty darn nice as is. Asking $60 + shipping. The light spots on the straps are not sun fade...just light reflection. Yeah...I'm willing to hold onto them for say 30 days. Steve,I'm interested in the 73 black belts. Will they work for Swivel Buckets? Do you have inner belts too? No...the retractors are stictly for bench; or, standard buckets (which, of course, never came on Chevys). I no longer have a set of '73 swivel belts. It's possible to swap the straps onto a set of swivel retractors...but, I don't have a left retractor (may be able to pull one from a Cutlass I know of); nor, a lower RH plastic retractor cover. Inner belts I have right now have the edges of the plastic sheaths split a couple of inches from the top (very common on these). I'll check around and see what I can come up with. Mcarlo77 wrote: Yeah...I'm willing to hold onto them for say 30 days. Mcarlo77 wrote: No...the retractors are stictly for bench; or, standard buckets (which, of course, never came on Chevys). Ok, thanks, Steve. Much appreciated. One time I bought a black belt and went out and got my A$$ kicked. Mcarlo77 wrote: Black belts are SOLD! Did you sell the shoulder portion? I have been looking for a set for awhile now, missed your post! I have the lap belts, just need the shoulder portion. OK, let me know. I have a '75, but should be the same, would be nice to have the date coded correct, but no big deal. No. 1974 & later have the shoulder retractor system by the rear roof sail panel. 73 was the last year for the separate shoulder straps that store in the retainers above door windows. I guess I'm wrong. The shoulder straps I have are date coded late 74. I guess they could work for a 75 if it has the separate shoulder straps. TW Monte wrote: I guess I'm wrong. The shoulder straps I have are date coded late 74. I guess they could work for a 75 if it has the separate shoulder straps. Bolts to the B Pillar, has a pin that goes into the lap belt? Then they should work. What do you want for them shipped to zip code 08535? I can PM you the whole address.